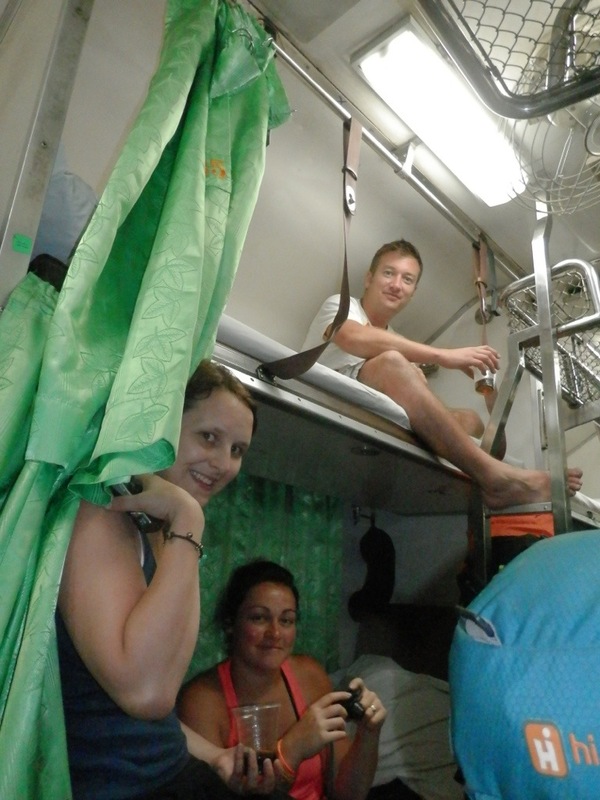 The sometimes crazy truck ride back to Koh Phangan port wasn’t as hair rising this time. In the daylight I could see how easily the road would flood and why the resort will shortly shutdown for the wet season. We had just over an hour to the ferry and found an Irish Pub with free wifi which gave me my first chance in 3 days to quickly catch up with family and friends and post my photo with a tiger from Koh Samui. On the over 2 hour ferry I sat in the air conditioned section chatting with Catherine and Sue both who I hadn’t had a great chance to talk in depth. Before I knew it we had docked and boarded our bus for a one hour ride to our overnight train. After a quick meal, made better by learning the train was slightly delayed, we got our assigned berths. I have some experience with overnight trains from my 2006 trip in China. This train was actually a little better. Cat purchased some rum and coke to have a celebratory drink to our joint experiences. This would be the last night together as people start leaving tomorrow night. The attendant expertly transformed our seats into bunks in seconds, amazing to watch. We even got privacy curtains which is a nice touch and the cabin we are sharing (there was 40 berths) was air conditioned. I actually got a lot of sleep only waking three times the first at 3 am. We arrived into Bangkok just before 8 am and walked to our hotel feeling very tired. While we couldn’t all check in we shared two rooms for quick showers before beginning our last full day together.